How can the healing power of nature come to bear in urban areas? Nature is the best medicine for such afflictions of civilisation as stress and depression. Our immune system is vitalised if we go into the woods. But how can we have the benefit of the healing power of nature in the city? A sylvan immersion in the city? Clemens Arvay is optimistic. The biologist demonstrates how and why cities designed close to nature have a positive effect on individual health and the wellbeing of society as a whole. The biophile city of the future consists of a networked system of eco-corridors guaranteeing better air quality and allowing everyone to stay in touch with nature. With suggestions as to how city dwellers can already live a greener life. "Clemens G. Arvay explains in an enjoyable and comprehensible way, which incredible healing forces nature keeps ready for city dwellers." "Clemens Arvay is one of the leaders of a new nature movement, that builds on traditional conservation and sustainability. In this book he takes the next step into a holistic view of humans as part of a symbiotic relationship with nature, living in new kinds of cities – ones that become engines of biodiversity and health for all species. I deeply admire Arvay's work. I wish all readers a joyful time with this informative book." "Clemens G. Arvay's book is a detailed, forward-looking presentation of our possibilities to design an ecological future even for our largest cities." "Outside the city walls nature waits and requests entrance. Clemens G. Arvay opens up a promising new perspective on urban life surrounded by the healing powers of nature: waterfalls are effective against depressions, health cures come from the soil, forest air increases our immune system. The 'Biophilia Effect' in the city is far from mumbo-jumbo. It is scientifically proven. It is not an industrial product, but available for everyone and for free. Doctors don't need to prescribe it, druggists don't need to compose it. How can we become 'urban biophiliacs'? What is the recipe for the success of our future city planning? This book offers the answers." "This book accomplishes an invaluably precious contribution for a change towards a holistic society. The biophilic city of the future is a cultural achievement." "Clemens G. Arvay submits a strong vision of how we humans will sovereignly transform our lifes in cities. With it's plurality of information and facts this book will become the new benchmark of sustainable city planning." "With this book Clemens G. Arvay has reconciled our modern urban civilisation with nature. Conveying scientific knowledge he deconstructs the dividing line between city and nature. He opens the city dwellers's eyes for the natural diversity in their urban habitat – and for a future, in which we will provide more space to plants and aminals in our metropoles." "Clemens G. Arvay's book conveys the material we are made of. His vision of being surrounded by green lungs and nature even in the cities of our beautiful blue planet, lets me breathe a sign of relief." 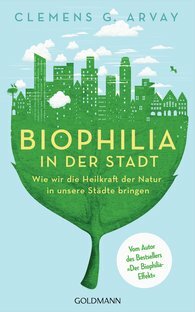 "This book is a carefully elaborated invitation to design future-oriented cities and overcome the contrast between city and nature, so that nature, which is essential for us, finds a new place in the city. Thus our children and our humanity will be visible in our cities again." "The author provides us with green hideaways for escaping from grey, everyday life."